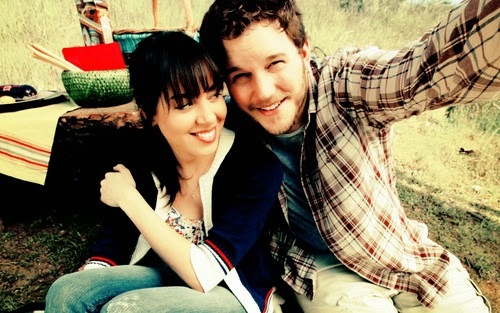 They say that opposites attract, and no couple quite reflects that as much as Andy and April Dwyer-Ludgate from Parks and Recreation. They have proved that it is possible to make a relationship work despite being Grumpy Cat (April) and an actual ray of sunshine (Andy). From their inception as a couple we've watched them grow and change, and we've shipped them through all of it. Here are my top 5 favorite Andy/April moments. Spoilers will abound! This episode is adorable, and extremely exciting, because this is one of the places it all began. We see the beginnings of Andy and April's budding romance, as their interactions subtly hint at something deeper than friendship. They're partners in crime for the entire episode, which makes it even cuter. After much deliberation, Andy and April's candid selfie is chosen to be put on the Parks department's summer catalog. It's perfect. This is a huge turning point in Andy & April's relationship! It takes place after they had a bit of a falling out over Andy's ex, Ann Perkins. This episode is where they start to rebuild things and grow to be the couple we know and love today. Obviously, a very important moment in their relationship. And, like most things they do, it's just really freaking adorable. And hilarious. 3. Andy and April's Fancy Party (3x9) || THEIR WEDDING. Just a few weeks after the events of Flu Season, April and Andy marry in a secret ceremony. And I cry everytime I rewatch it. Their vows are so sweet, and their love for each other is so evident. Need I say more? If you didn't ship them before this, you have to ship them now. While it's a bit startling for them to get married so young and fast, it reflects how much Andy and April embrace life to the fullest. This could be seen as an impulsive marriage for some people (*cough* Leslie *cough*), but as we see in upcoming seasons, Andy and April knew exactly what they wanted, and their relationship stands the test of time. Getting married when they did was exactly the right choice. And I'm incredibly glad they did it. Andy + April are such a gift. In this episode, Andy and April try to do as many things on Andy's bucket list as they can, including an impromptu to the Grand Canyon. It's a mixture of touching, funny, and inspiring. A cap from this episode was my Tumblr icon for a while. It's honestly one of the sweetest pictures of Andy and April I've ever seen. I adore it. This is one of our last moments with Andy and April before the season finale. April wants to go to Washington D.C., which means Andy has to leave his job as Johnny Karate. This exchange happened. And I cried. This is the crux of Andy & April's relationship. This sums up what they have been about for all 7 seasons. It's the perfect ending for one of the sweetest romances in TV history. Thank goodness for Parks and Rec and for April and Andy. I can't imagine my life without them. What about you? What are your top 5 April & Andy moments? If you ever feel you can watch it, I'd HIGHLY recommend it. The inappropriate moments are worth it for the hilarious content. Seriously a genius show. I love seeing the screen caps too. And YES. Ron Swanson is my favorite. *fangirls* WHAT THANK YOU YES THIS IS IN ALL-CAPS THANK YOU. *calms down* seriously though. this is perfection. I love April and Andy. so much. I'M SO GLAD YOU LIKED IT. I love April and Andy so much too. Seriously one of my absolute OTPs.